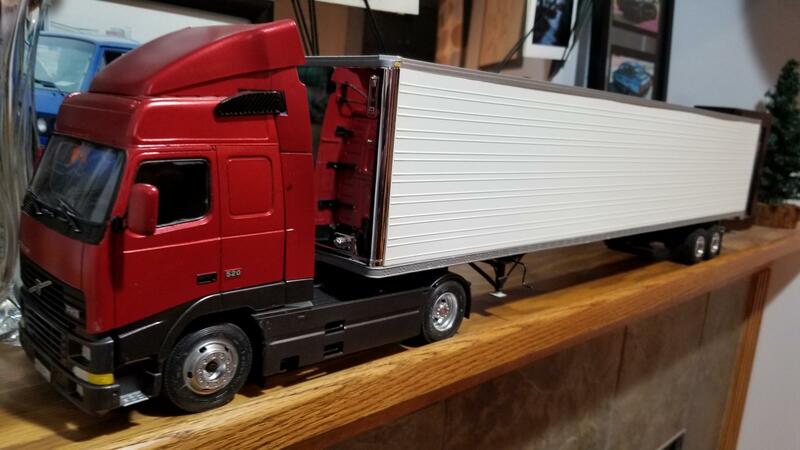 Currently the only tractor that I have from a European manufacturer that is not in the box is a Revell of Germany Kenworth W900. I did put some of the AMT trailers behind it just for fun (didn't take any photos), and the only one I remember having an issue with was the Wilson Livestock Trailer because of the belly on the trailer & the long rear frame on the tractor. The fifth wheel carrier is molded onto the fifth wheel slide plate so you cannot change the location. I would think that is the landing gear is far enough back, then you shouldn't have a problem with the dry or refer vans, or the flatbed; but the livestock & lowboy trailers could present an issue. 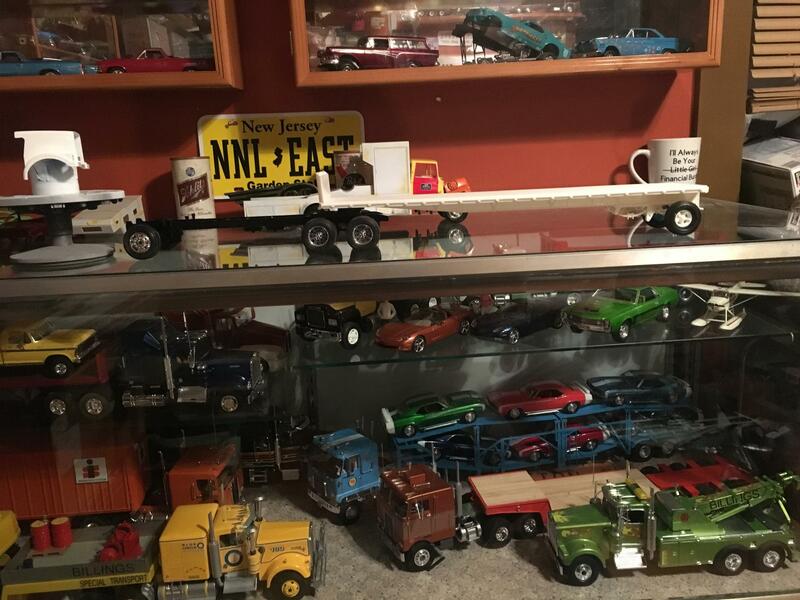 Since the car hauler & the Western Star 4964 are both Revell of Germany kits you shouldn't have an issue. Maybe. 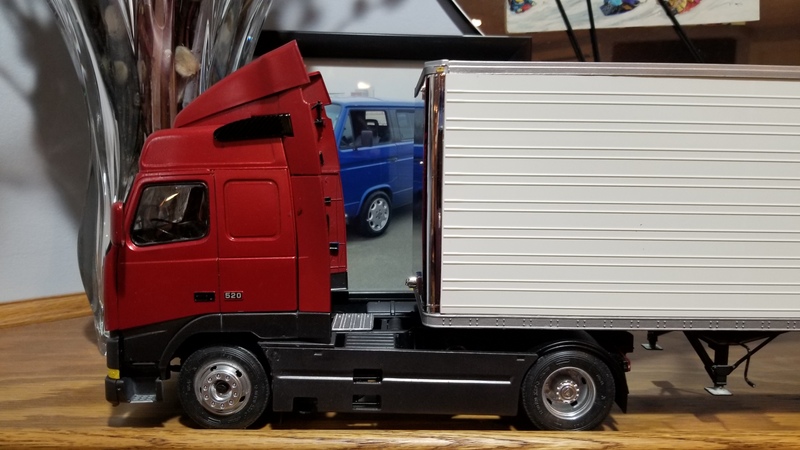 The Revell Germany Kenworth W900 and their other truck kits are in the same 1:25th scale as the AMT and Moebius trucks and trailers, the Italeri and Heller trucks are in 1:24th scale so they are slightly larger. But the difference is quite small so it will most likely work, one thing to remember tho', the AMT trailers are from the early 70's so most of them are 40 foot, the trailers today are longer, up to 53 foot. Thanks guys, I know they will work, was hoping to see some photos to get some perspective, if that makes sense. I know it's not exactly what you're after, but here's the Italeri Volvo FH16 and the Moebius 53ft trailer. 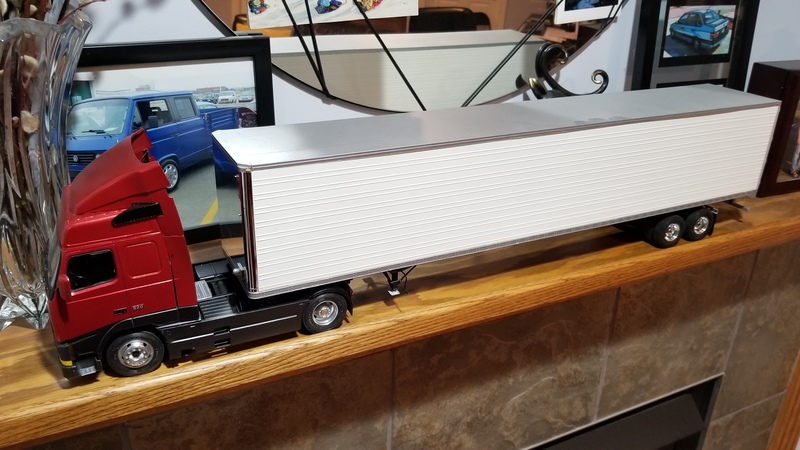 1/24 tractor, 1/25 trailer. Slightly out of proportion, but not horrible. 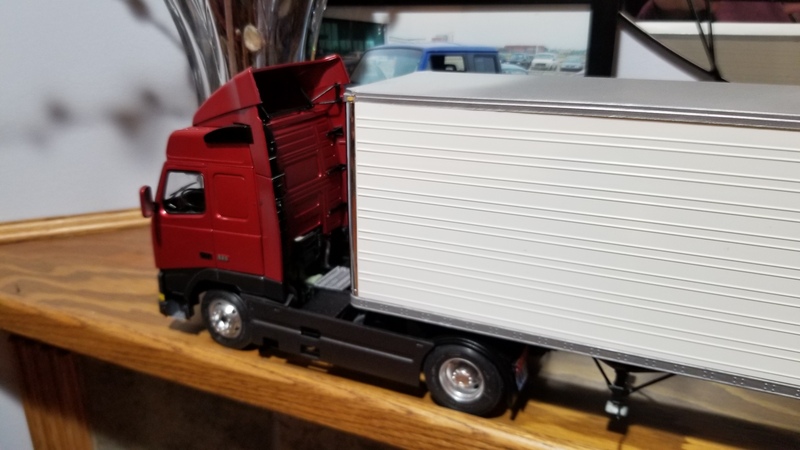 I don't have any of my Italeri American trucks built yet. So can't get that comparison going yet. Width is almost exact, but the height is visibly out. The more I look at the pics, the more it bugs me. lolz. I think I need to pick up some Italeri trailers. In Europe the maximum hight is between 4.00 to 4.50 meters (13' 1.5" to 14'9") depending on country, Ireland allows 4.65 meters (15' 3") and some countries like Sweden, Norway and some others have no hight limit, it's the hight of hanging cables, bridges and tunnels after the route you plan to drive that decides how high you can be, in Sweden things with a hight over 4.5 meters is not marked out, but everything under 4.5 meters is. In the US is the hight limit after what I understand 13' 6" wich is 4.115 meters. Here in Europe the allowed width is between 2.55 (slightly over 100") to 2.60 (slightly over 102"), and the US has 102" (2.59 meters) so it's close. If we scale down the 13' 6" hight to 1:24th scale we get 171.5 millimeters (6.75") and to 1:25th scale we get 164.6 millimeters (slightly under 6.5"), difference about 0.25" between the scales. The 102 inch width is 107.9 millimeters (4.25") in 1:24th scale and 103.6 millimeters (4.08") in 1:25th scale, 0.17" difference. Not much but there is a difference. To the untrained eye no one can really tell. There only a few MMs different. For the detail buffs that know that would drive them crazy. Thanks guys, again, I’m not super crazy over the difference in size as much as how things look. 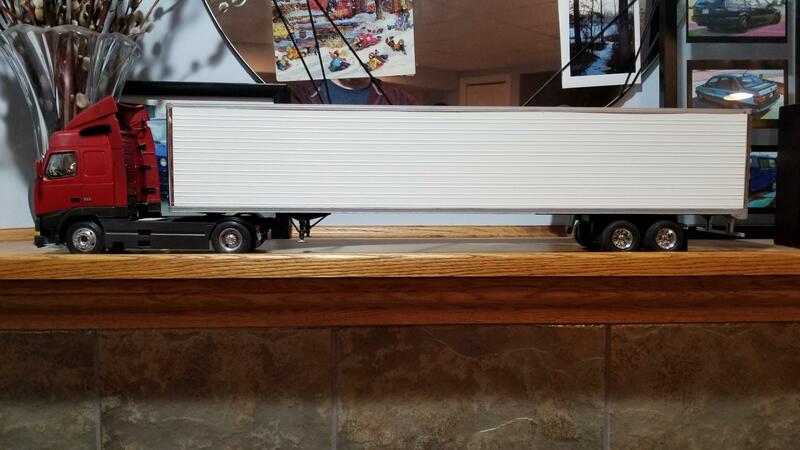 As with the pics posted, it looks plausible, not like the rig has a 1/16 trailer behind or, a 1/32 trailer behind it. The AMT trailers will sit a a tad lower in the backin. Maybe you could use a spacer under the trailer and 1/24 tires. See if that helps. (Just a idea). Thanks for the heads up, I will keep that in mind when I do the trailer.